The St Petersburg’s International Economic Forum offers an annual attempt by Russia’s business and political classes to present themselves as no less corrupt and progressive than their counterparts who meet earlier in the year at Davos, Switzerland. The St Petersburg International Economic Forum offers an annual attempt by Russia’s business and political classes to present themselves as no more corrupt or less progressive than their counterparts who meet earlier in the year at Davos, Switzerland. Since its inception in 2005, the forum has been an obligatory stop for foreign energy brokers wishing do business with Russia. Once there, they pose for a photo with President Vladimir Putin and praise his benevolent free-market rule before moving on to more byzantine backroom battles for his favor. This year’s meeting – billed by the propaganda network RT as “achieving a new balance on the global stage” – featured the usual round of genuflecting oil barons and Swiss bankers as well as stock opportunities for Putin to sneer at Washington, now, of course, easier than ever. But this year’s forum served up something new in the Lazarus-like appearance of Anatoly Chubais, Russia’s original free-market reformer, who since leaving the Kremlin’s inner sanctum has steered state owned electric monopoly RAO UES, and later, the edgier, Elon Muskier, yet still state-owned ROSNANO nanotechnology outfit where he remains today. His opinions on economic trends continue to matter, not the least because his privatization policies and the corruption that followed presaged the rise of Putin’s managed capitalism and the Kremlin’s political weaponization of Russia’s oil, gas and media elites. When Chubais starts making economic predictions, in other words, some version of what he is saying will likely come to pass. All of which makes his assertion at the economic forum that green energy will hit Russia with the impact of the “Great October Socialist Revolution” breathtaking – if not frightening. At the forum, Chubais offered the gathered CEOs the bold strokes of Russia’s nascent forays into alternative energy in an economy dominated by and dependent upon fossil fuels. He cited a wind energy park that will start operating in 2017, and said the country could even make breakthroughs in battery technology, arguably the holy grail of an alternative energy revolution. Alexei Teksler, deputy minister of energy, joined his enthusiasm, saying the world was experiencing shock waves in power production and energy storage, and called these developments a challenge to Russia’s way of doing business. The recently published “Strategy of Economic Security of the Russian Federation” signed off on by Putin in May, actually identifies a global green revolution as an economic threat to Moscow. The document gets specific, saying that “changes in the structure of world demands for energy resources and structures of their use, the development of energy storage technologies and the falling material-output ratios, the development of green technology” all put Russia in a dire position. To this, said Teksler, Russia must adapt. 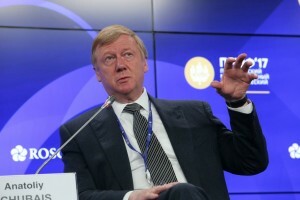 To answer whether Russia, with all of its fossil fuel resources, should bother with wind and solar, Chubais broke out an energy economics term called “grid parity” – the situation where the net cost of producing a kilowatt-hour on traditional sources equals the net cost of a kilowatt-hour produced on alternatives. Chubais said that the balance was tilting worldwide toward lower costs for producing on alternative resources, and added that Russia would soon reach that tipping point as well. “If we are standing in place waiting when that happens, then we will be forced to shift to full-scale massive import,” he said. “That would be a short-sighted and unpromising scenario. As the CEO of a state-owned business, however, he didn’t let his criticism get overly withering, and he offered praise for the Russian government’s “colossal work” toward creating a system in which alternative energy could flourish. This is a surprising conclusion about a country where less than 1 percent of energy is produced by renewables, and where legislation has only just started to offer subsides on alternative energy projects. Still, he pointed to the opening of a solar power farm in the southern province of Bashkiria, Russia’s second, and said solar farms were proliferating. He also said Russia was producing solar panels at an input-output rate of 21 percent, which he claimed as the highest percentage in the world. 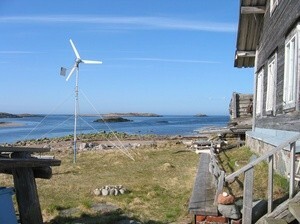 Likewise, he said, the Russian government has a $500 million agreement for wind power development, something that might be welcome to Northwest Russian wind developers who have for decades sought funding and approval. For now, said Chubais, most of Russia’s wind capacity will be built in the Ulyanovsk region in the South. In the 1990s, Chubais’s engineered through vouchers and privatization the crony capitalist modern Russian state the world knows today. In 20 years, it will be interesting, for better or worse, to see if the Russian alternative energy state he envisions is still struggling as well.